Claudio Ranieri is back in the Premier League and the manager who led Leicester to the top has the task of somehow hauling Fulham off the bottom. Ranieri was installed at Craven Cottage after Slavisa Jokanovic was sacked, having taken five points from 12 games. Jokanovic becomes the first managerial casualty of the Premier League season, just six months after securing promotion in the play-off final at Wembley. 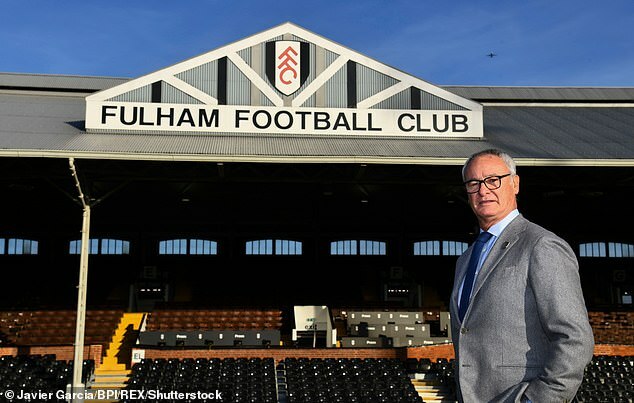 Fulham owner and chairman Shahid Khan thanked him for his service and hailed Ranieri as a ‘risk-free’ appointment and ‘ready-made’ replacement. The 67-year-old Italian overcame odds of 5,000-1 as he won the title with Leicester in 2016, only to be sacked nine months later. He has been out of work since leaving Nantes in the summer after one season with the French club. Ranieri’s priority will be to focus on strengthening a defence which has conceded 31 goals in a dozen games while trying not to lose the threat of Aleksandar Mitrovic and coaxing more from 18-year-old Ryan Sessegnon. This is the key to restoring confidence and convincing the players they belong in the top flight after a demoralising seven defeats in a row. ‘The objective at Fulham should never be to merely survive in the Premier League,’ said Ranieri. ‘We must at all times be a difficult opponent and should expect to succeed. Fulham’s next fixture is at home to fellow strugglers Southampton a week on Saturday.